I Fell at Work, Can I Sue? I Fell at Work: Can I Sue? If you’ve sustained an injury at work due to a fall while you were on the job your probably wondering: I fell at work; can I sue? The answer is, probably not. Although Texas law does not require it, most employers choose to provide workers’ compensation benefits to their employees, so that in the event of an accident, injured workers are able to recover compensation regardless of fault. Employees who have access to compensation are generally prohibited from filing negligence claims against their employer (ie. “suing their employee”) for injuries resulting from the fall at work. There are some cases, however, where an injured party can sue either his or her employer or a third party. Unfortunately, navigating this area of the law can be difficult, so if you were injured because of a fall at work and have questions about collecting compensation, it’s important to consult with an experienced slip and fall attorney who can evaluate your case and explain your legal options. 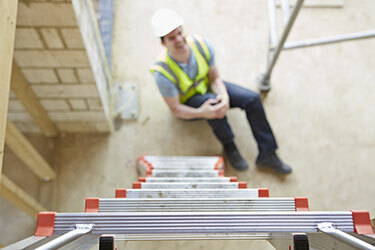 When an employer offers workers’ compensation insurance, employees who are injured on the job because of a fall will receive compensation automatically, regardless of fault, as long as the injury was sustained in the course and scope of employment. Acts of God, including natural disasters. Otherwise, as long as an injured employee notifies his or her employer of the injury within 30 days of the accident and files a claim within one year of the injury, he or she should be covered by workers’ compensation, which provides medical benefits, income benefits, and death benefits. When employers do not offer workers’ compensation to employees, they can be held liable for injuries sustained by workers who slip and fall while on the job. Furthermore, companies who opt out of providing workers’ compensation are prohibited from arguing that the injured party contributed to the accident or that they aren’t liable because the employee assumed the risk of injury by accepting employment. When an employee is required to use unreasonably dangerous premises and despite his or her awareness of the dangers, is incapable of taking precautions to reduce the risk. If one of these exceptions applies, the employer may owe a duty to protect the employee from the unreasonably dangerous condition despite the worker’s awareness of it. Successful plaintiffs may be able to collect not only damages to cover medical expenses and lost wages, but also property damage and pain and suffering. If you fell at work and were injured but you’re unable to recover from your employer, you may still be able to collect compensation if the injury was caused by another third party. In these cases, you must be able to establish that a third party’s negligence caused you to fall at work, which in turn resulted in an injury. Third party claims are most common in industries where multiple individuals, usually subcontractors, must work independently on the same site. For instance, if a plumber drops a truck load of pipes during delivery and an electrician working on the same project slips and falls as a result, the plumber or his or her employer could be held liable for the electrician’s injuries. Alternatively, if a manufacturer provided a defective concrete mixer, which subsequently leaked, causing a worker to slip and fall, that manufacturer would be held liable. However, if an injured party receives workers’ compensation benefits and a settlement from a third party, he or she will most likely be required to reimburse the workers’ compensation insurer for the funds that they provided. The property owner where the injury occurred. If you fell at work and suffered injuries, and you want to know who is liable, please contact Sutliff & Stout by calling 281-853-8446 today. A member of our legal team can also be reached via email or text.